Wu Chen Recommends...Let's Cook Japanese Food! My great-grandmother was Japanese. My grandfather, a terrific cook, learned to cook from her and he passed some of that knowledge, along with his Japanese knives and pans, to my mother. He refused to pass any along to me - especially the coveted tamagoyaki pan: I “wasn’t ready”. To be fair, he was definitely right about that. On her most recent visit, my mother brought me a copy of Let’s Cook Japanese Food! by Amy Kaneko. It wasn’t originally intended for me, but like so many things in my family, these things are ultimately communal. 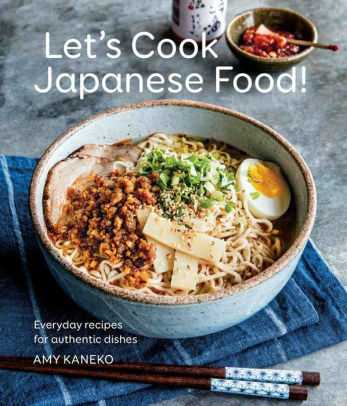 My mother learned that the book was written for someone living in the continental US - intending to try and cook Japanese everyday, home cooking with the tools and ingredients readily available in most cities in the US - and then it made sense to my mother to pass it on to me (she lives in Malaysia). I’ve been reading it since, and it really is quite a delight. The food is all familiar from growing up, and the ideas are accessible and readily achievable with what is at hand. It’s a wonderful breath of fresh, delicious and healthy air, and it’s a fun, inspiring read too!